David McDonough has nearly a decade’s worth of experience working in football. 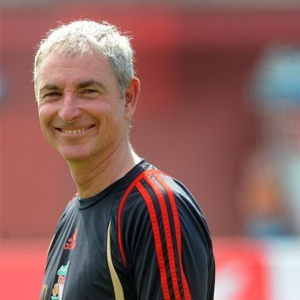 He has previously been the Head of Technical Analysis at Liverpool FC and Inter Milan. Most recently, he spent a year at West Bromwich Albion FC as the Director of Technical Performance and Scouting. Looking to expand on his skills and knowledge, David has been studying to become a qualified personal trainer with HFE. Considering your successful career in football to-date, why have you chosen do a personal training qualification? There are four pillars that are fundamental to the sport of football – technical, tactical, physical and psychological. Having spent many years working at the top level of professional football at clubs like Liverpool, Valencia and Inter Milan, I have tried to study and master each of these principles of the game. I have recently taken some time out of working in the game and I felt that it would be beneficial to enhance my physiological understanding of the body and combine that with how to individualise training which is difficult to achieve in a team sport training plan. For those who may not be too familiar with it, could you briefly explain what technical analysis is? This role varies at different clubs, but the basic tasks are to analyse the performance of your own squad collectively and individually, both in competition (matches) and in training. The key objectives for the role are to improve player and team performance in all of the four pillars I mentioned. How much personal accountability has been involved with your previous football roles? And is there any room for subjective opinion or does everything have to come from a place of facts and statistics? In professional football everyone is personally accountable for their work. Even if you are a member of a large department within the club, normally you will have specific tasks and a role that only you will control. In conditioning (the physical elements), science can help you enormously, so data becomes a significant indicator to analyse both in competition and training. This is less so with technico-tactical data which can only help you so much, therefore naturally the analysis is more subjective. I have many. I was at Liverpool FC when we won the UEFA Cup in the late nineties, the Champions League in Istanbul, followed two years later by another Champions League final appearance, an FA Cup win, and the FIFA Club World Champions at Inter Milan. But it isn’t all about trophies. The memories I have of working with top players has been very rewarding. Are there any lessons/tips you’ve picked up from your time in football that perhaps personal trainers and other fitness professionals could use with their clients? There are not many sporting activities that do not have a physical conditioning element to performance. Clients may just want to look good and live healthily, but many participate in competitive sport even at a low level. They will usually want to improve their individual performance and a personal trainer can help them enormously in their goals and enjoyment of their chosen sport. Even in team sports, try to individualise the physical elements of a player’s performance as much as is possible within the restrictions of team training.